Liczba stron: 1072 Jest to ujednolicona liczba stron, która ułatwi Ci porównanie długości książek. Każda strona Legimi to 200 słów. Amelia is a sentimental novel written by Henry Fielding and published in December 1751. It was the fourth and final novel written by Fielding, and it was printed in only one edition while the author was alive, although 5,000 copies were published of the first edition. 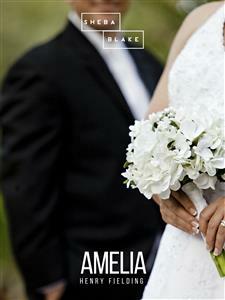 Amelia follows the life of Amelia and Captain William Booth after they are married. It contains many allusions to classical literature and focuses on the theme of marriage and feminine intelligence, but Fielding's stance on gender issues cannot be determined because of the lack of authorial commentary discussing the matter. Although the novel received praise from many writers and critics, it received more criticism from Fielding's competition, possibly resulting from the "paper war" in which the author was involved. Amelia, by contrast, resists the attentions paid to her by several men in William's absence and stays faithful to him. She forgives his transgression, but William soon draws them into trouble again as he accrues gambling debts trying to lift the couple out of poverty. He soon finds himself in debtors' prison. Amelia then discovers that she is her mother's heiress and, the debt being settled, William is released and the couple retires to the country. Copyright © 2018 by Henry Fielding. "Give me back, give me back, the wild freshness of morning--Her smiles and her tears are worth evening's best light." It is, however, usual to detect a lack of vivacity in the book, an evidence of declining health and years. It may be so; it is at least certain that Fielding, during the composition of Amelia, had much less time to bestow upon elaborating his work than he had previously had, and that his health was breaking. But are we perfectly sure that if the chronological order had been different we should have pronounced the same verdict? Had Amelia come between Joseph and Tom, how many of us might have committed ourselves to some such sentence as this: "In Amelia we see the youthful exuberances of Joseph Andrews corrected by a higher art; the adjustment of plot and character arranged with a fuller craftsmanship; the genius which was to find its fullest exemplification in Tom Jones already displaying maturity"? And do we not too often forget that a very short time--in fact, barely three years--passed between the appearance of Tom Jones and the appearance of Amelia? that although we do not know how long the earlier work had been in preparation, it is extremely improbable that a man of Fielding's temperament, of his wants, of his known habits and history, would have kept it when once finished long in his desk? and that consequently between some scenes of Tom Jones and some scenes of Amelia it is not improbable that there was no more than a few months' interval? I do not urge these things in mitigation of any unfavourable judgment against the later novel. I only ask--How much of that unfavourable judgment ought in justice to be set down to the fallacies connected with an imperfect appreciation of facts? To me it is not so much a question of deciding whether I like Amelia less, and if so, how much less, than the others, as a question what part of the general conception of this great writer it supplies? I do not think that we could fully understand Fielding without it; I do not think that we could derive the full quantity of pleasure from him without it. The exuberant romantic faculty of Joseph Andrews and its pleasant satire; the mighty craftsmanship and the vast science of life of Tom Jones; the ineffable irony and logical grasp of Jonathan Wild, might have left us with a slight sense of hardness, a vague desire for unction, if it had not been for this completion of the picture. We should not have known (for in the other books, with the possible exception of Mrs. Fitzpatrick, the characters are a little too determinately goats and sheep) how Fielding could draw nuances, how he could project a mixed personage on the screen, if we had not had Miss Matthews and Mrs. Atkinson--the last especially a figure full of the finest strokes, and, as a rule, insufficiently done justice to by critics. And I have purposely left to the last a group of personages about whom indeed there has been little question, but who are among the triumphs of Fielding's art--the two Colonels and their connecting-link, the wife of the one and the sister of the other. Colonel Bath has necessarily united all suffrages. He is of course a very little stagey; he reminds us that his author had had a long theatrical apprenticeship: he is something too much d'une piece. But as a study of the brave man who is almost more braggart than brave, of the generous man who will sacrifice not only generosity but bare justice to "a hogo of honour," he is admirable, and up to his time almost unique. Ordinary writers and ordinary readers have never been quite content to admit that bravery and braggadocio can go together, that the man of honour may be a selfish pedant. People have been unwilling to tell and to hear the whole truth even about Wolfe and Nelson, who were both favourable specimens of the type; but Fielding the infallible saw that type in its quiddity, and knew it, and registered it for ever. Less amusing but more delicately faithful and true are Colonel James and his wife. They are both very good sort of people in a way, who live in a lax and frivolous age, who have plenty of money, no particular principle, no strong affection for each other, and little individual character. They might have been--Mrs. James to some extent is--quite estimable and harmless; but even as it is, they are not to be wholly ill spoken of. Being what they are, Fielding has taken them, and, with a relentlessness which Swift could hardly have exceeded, and a good-nature which Swift rarely or never attained, has held them up to us as dissected preparations of half-innocent meanness, scoundrelism, and vanity, such as are hardly anywhere else to be found. I have used the word "preparations," and it in part indicates Fielding's virtue, a virtue shown, I think, in this book as much as anywhere. But it does not fully indicate it; for the preparation, wet or dry, is a dead thing, and a museum is but a mortuary. Fielding's men and women, once more let it be said, are all alive. The palace of his work is the hall, not of Eblis, but of a quite beneficent enchanter, who puts burning hearts into his subjects, not to torture them, but only that they may light up for us their whole organisation and being. They are not in the least the worse for it, and we are infinitely the better. SIR,--The following book is sincerely designed to promote the cause of virtue, and to expose some of the most glaring evils, as well public as private, which at present infest the country; though there is scarce, as I remember, a single stroke of satire aimed at any one person throughout the whole.